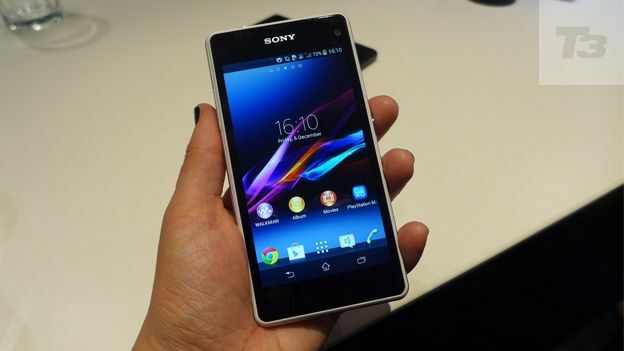 The Sony Xperia Z1 Compact is a phone that looks to disprove a theory, smartphones don't need to be bigger to be better. With rivals like the LG G2, Samsung Galaxy Note 2 and even the Sony Xperia Z1 showing that there is a desire for big screen phones they've often suffered from the sheer logistical issues of having an everyday device that can no longer be held and used with one hand. By being smaller then surely it must be a mid-range smartphone? Well at nearly £450 there's nothing mid-range about the price and as any Apple iPhone 5s owner will tell you, those 4 inches of screen real-estate don't come cheap either. This then is a flagship phone, repackaged into a more compact form factor and aimed at those who want the portability of the iPhone but prefer Google Android. So here's the question, can the Z1 Compact really take on both the big-screen flagships and fend off the likes of the HTC One Mini and the Samsung Galaxy S4 Mini? Taking your first glance at the Z1 Compact and you'll realise that this is still a Z1, the design is almost identical to its larger brother introducing the premium metal build and glass back. Measuring in at 127 x 64.9 x 9.5 mm and weighing just 137g the Z1 compact is slightly larger than an iPhone 5c and weighs slightly more. Overall it feels great to hold although that glass back is going to become a magnet for scratches so if you're image conscious we'd recommend a case. The build quality is as high as you'd expect from Sony's new Xperia Z range and we reckon it trumps the One mini and the iPhone 5c. However, the display tends to attract dust and fluff - you'll rue the day you left a tissue in your trouser pocket then washed them. The phone is available in black, white and two new, surprisingly inoffensive shades - pink and lime. The Z1 Compact comes running Android 4.3 Jelly Bean and while for larger phones that may not present much of an issue, for the Z1 Compact you'll soon realise that the update to KitKat will make a huge difference. The reason is full-screen apps. The 4.3-inch display is gorgeous but at the moment many of the apps appear unnecessarily small thanks to the status and menu bars being permanently placed at the top and the bottom. By adding full-screen apps you remove the clutter and make use of every mm the screen has to offer. We're hoping Sony rolls out an Android 4.4 update soon. That one issue aside and you'll find yourself greeted with a wealth of Sony's own apps including Track ID, Track ID TV and Smart Connect which is your portal to Sony's connected devices. Finally there's the Sony Entertainment Network which is baked into the Movies, Reader and Walkman apps so should you become a member all your free content is integrated into your existing library of media. Walkman isn't a new app, but for those that don't know it's an arguably superior alternative to Apple and Google's own music players. Sony has unsurprisingly used its audio expertise so the app comes with a wealth of customisation options letting you fine tune the music to your own tastes. Finally, like other manufacturers Sony has realised that if it's going to coax people away from Apple it'll need to provide a migration that's as painless as possible and setting up the Z1 Compact couldn't be easier. Simply plug your phone into your PC or Mac and the software automatically installs, you can then sync with iTunes, transfer over all your contacts, emails and more. No this isn't a new feature on smartphones but it's worth mentioning because Sony's method is so seamless. The Z1 Compact comes with a 4.3-inch 1280x720 TRILUMINOS display with X-Reality engine display. No, it's not Full-HD but on a phone this size the difference wouldn't really be noticeable and it'd just kill the battery life. For those that are still concerned the Xperia Z1 Compact actually has a higher pixel-density than the iPhone 5s at 342ppi and as seen on the Xperia Z1 the TRILUMINOS and X-Reality tech are rather more than just gimmicks. This display is vibrant, bright and colours pop out of the screen. Scroll through your images and you'll notice a considerable improvement while videos, unsurprisingly, look fantastic. The camera is the same 20.7MP Sony Exmor RS Sensor for mobile that you'll find on the Z1 and the performance is equally as impressive. Hold down the camera icon and the camera will boot from standby in around 2 seconds. Once inside the camera app you'll be greeted with tonnes of options to tweak, for starters the camera doesn't actually shoot in 20.7MP, instead it shoots at 8MP giving you the option of a 4x Zoom with no loss of quality. Press the menu button on the lower right-hand side and you're presented with a variety of options from Manual control to Info-Eye which searches the web to grab info about what's in the image. It's a fantastic camera with great low-light performance and the 4x optical zoom is more than useful. Here's where the good news gets better - despite boasting one of the fastest processors on the market the Xperia Z1 Compact has a fantastic battery life. With moderate use (music, messages, email and the odd bit of browsing) we managed to reach the end of each day (8-9pm) with around 20-40 per cent battery life having unplugged it at 7.30am each morning. It's not often we get to say that, and it's a welcome feeling to have gone a day without having to frantically plug the phone in by lunchtime. A lot of the answers to its performance can be found in the Power Management Settings where Sony has packed in a huge range of power-saving features which look to provide a balancing act between performance and practicality. STAMINA mode disables background data while Queue background data groups data dumps saving considerably on battery. One of the most useful features however is Location-based Wi-Fi which means the phone will automatically turn Wi-Fi on when it recognises a previously joined network. Leave the area and it'll turn Wi-Fi off for you, saving on precious juice. Inside the Z1 Compact you'll find that it really is only the size of the screen that's different. There's a blistering 2.2GHz Quad-core processor along with 2GB of RAM, as such this phone flies through tasks and apps. You get 16GB onboard storage with the option to add an extra 64GB via MicroSD, 16GB may not sound like much but it is on par with iPhone 5c and then HTC One mini. If we have one issue it's Sony's version of Android. It hasn't changed much since the first Xperia handsets and it could do with updating. It's not that it's ugly, more that it's beginning to look a little dated. There is then the small issue of cost. At £450 it's not wallet-friendly, but then this isn't a budget phone. What's important to note is that Apple's smaller iPhone actually costs more, indeed the iPhone 5c 16GB costs £469 while the iPhone 5s starts at £549. Is it justified? Perhaps with the iPhone 5s we can understand some of the price but stacked against the 5c we'd choose the Xperia Z1 Compact every time. It's the best of all worlds combining a huge processor with a great screen and truly usable battery life, all packed into a metal-encased waterproof package, what's not to like?